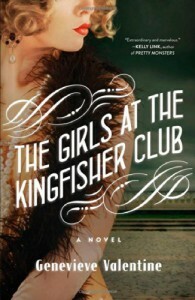 The Girls at the Kingfishers Club is the retelling of the Twelve Dancing Princesses fairy tale, set in Manhattan during the Jazz Age. The year 1927, there were 12 girls, the Halmilton sisters, confined by their father at their Manhattan townhouse. This led them to sneak out of their house when the sun went down to dance the night away at fabulous jazz clubs. The sisters enjoy their nocturnal ventures, but for the sake of keeping their identity safe they never give their real name; hence everyone at the dancing scene calls them “princesses”. “lured in numbers, by immodest music and the demon drink, like princesses into that dark underground which leaves no innocent unsullied”. This made him realize that his daughters are reaching a certain age, so he decides to arrange lunches/interviews at their home with possible suitors for each of their daughters. The setting is marvelous. I felt transported to the 1920s. I could picture the underground clubs, listen to the jazzy tunes and imagine the outfits and hairdos in my mind. The lovely feminine woman in the cover was also a great aid for my imagination. - There were too many characters and I couldn’t completely bond with them. - The sisters don’t get the same exposure in the story. - I also felt like there where loose ends. - The other thing that didn’t do it for me was the lack of romance. More in depth thoughts about this on the full review on my blog. The Girls at the Kingfishers Club is a book I recommend as transitional read, a short quick story in between long and heavy books. If you like stories about sisterhood this is the book for you. If you like to listen to 1920s jazz this is the book for you. If you’re of age, this story is the perfect companion for your gin on a summer afternoon. If you’re a fan of fairy tales retold, this is the book for you. It takes you away back to a place and time that is more believable than the original fairy tale.